I've been using JEE6 with Netbeans and Glassfish for a while and decided I should update my tutorial Creating a JEE application in Netbeans 6.5 to JEE6. I'm following a similar loose format and creating a skeleton of an application to show case the various tiers (ORM, business objects and web) and give you an overview of what is possible. I also want to demonstrate how easy developing EJB applications has become since the spec came out. I wouldn't be developing with it if it wasn't. I'm in my testing project group and turning the music on (Charls Riff). 'OK' and the new Java DB database will be created and start the server if not started. Leave everything else as default and press 'Finish'. 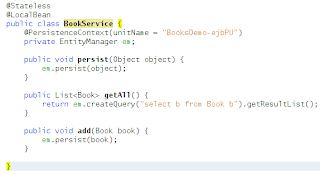 In the BookService class, right click -> Persistence -> User Entity Manager, this will add an instance variable for the entity manager. Next we need to flesh out the methods a bit. OK, that was the business tier, please note there are no longer any interfaces created for the SessionBean! hmm, thinks a bit as to how to go forward this time.. Lets run the application here and do a sanity check: right click on the BooksDemo main project (probably highlighted) and select 'Run'. 32 seconds to build, browser coming up and we have 'Hello World!' 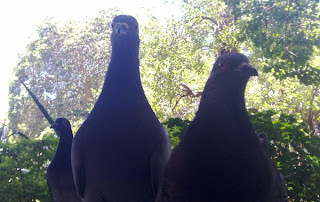 staring at us, yay. We are looking at the default index.jsp page that was created by Netbeans when we created the project, there is no connection to the datastore or enterprise bean at this stage, but the database should have bean created. Go to the Services window (Ctrl+5), under Databases select the database that we created at the begining of the tutorial, right click and 'Connect', then click to explore the node and select 'BOOKSDEMO', open it and open the 'Table' node. You will see that the 'BOOK' table has been created for you and is made up of an 'ID' column and a 'TITLE' column to mach the properties in the Book entity class. Note the new 'Webservlet' attribute on the class, this means no more editing of the web.xml for serlvets! In the Services window (Ctrl+5), right click on the BOOK table and select 'View Data' - you will see a new row inserted with the title 'test'. If you reload the page in your browser, you will see a list of books added to the datastore. And at 16:17, thats a wrap! I'll leave it as an exercise for you to 'dolly' it up. I'm wondering why you chose to demonstrate JSP here. JSF2.0 is the standard web-framework in JEE6, officially deprecating JSP. You would need much less work in the UI display layer if using JSF. I prefer JSP (without scripting) as the most agile and expendable way of developing a web front end. I've alway liked the idea of JSF and have used it in projects, but haven't found it to be that useful in practise. Could you add your source for the comment that JSP has officially been deprecated? (just out of interest). Anyway, I thought your use of timehacks and 'breadcrumbs' to show menu choices were good. I may have to adapt those in my blog once in a while! but the last one I don't know how to fix it. I am new to java programming. Do you have the source code for this project somewhere so I can download it. The image for the Book Servlet is incorrect. You included the Session Bean's one. You won't believe me but once I posted my comments I found the error. Could you please ignore my two previous posts. Thank you again for your tutorial. It has been very illustrative to me. I was looking for a tutorial that would let me work on EJBs with the default database and glassfish app server in Netbeans, and this tutorial just hit the spot right on. Highly reccommended for EJB newbies - keep up the good work!